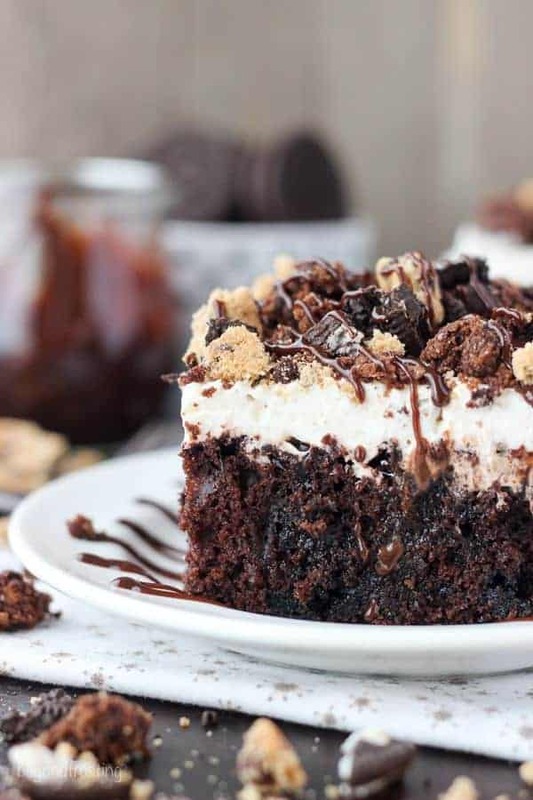 The best of all worlds, this Slutty Brookie Poke Cake is a chocolate cake filled with chocolate pudding, topped with whipped cream and crush Oreos, Brownies and Chocolate Chip Cookies. We just returned from a whirlwind weekend in Banff and Lake Louise Canada, which was a last-minute decision but one of the best trips we’ve taken. I can’t wait to share more details with you. It’s rare that we take a vacation that isn’t centered around snowboarding. We went with no real agenda and at times just pulled off the freeway to explore. It was so much fun and definitely one of the most beautiful places I’ve ever seen! 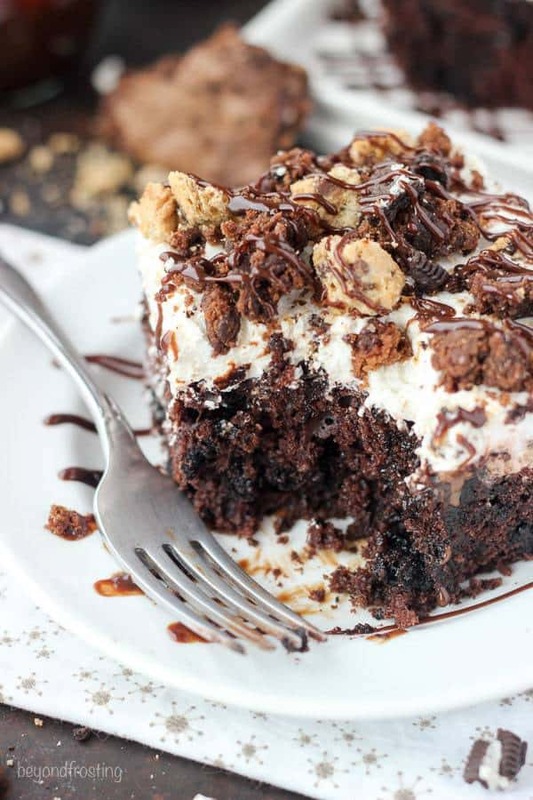 When it comes to chocolate cake, I feel like I know a thing or two about it. What’s that wow factor that it means to get right back in for that second bite. 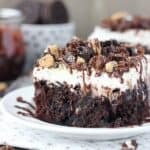 It’s certainly necessary that a chocolate cake is rich in flavor, but not so rich that you can only have a few bites. The crumb needs to be airy in texture and melt in your mouth. The topping should complement not compete with the cake. 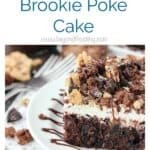 This Slutty Brookie Poke Cake is an evolution of a few different desserts I’ve made including the No-Bake Brookie Icebox cake and it’s in part due to my complete obsession with brownie batter Mousse. You’re welcome. 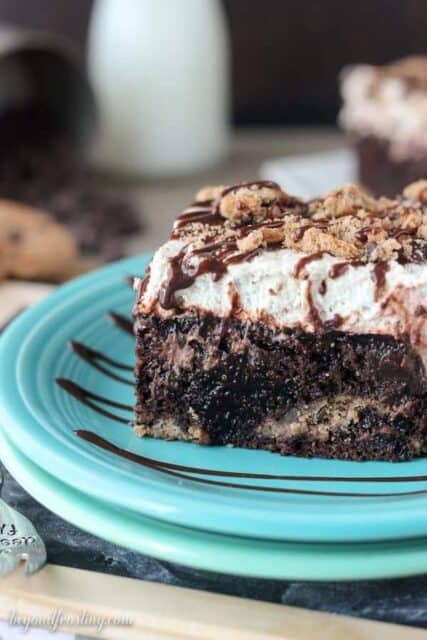 A brookie is a combination of a brownie and a chocolate chips cookie, but once your add in the Oreo it becomes a “slutty brownie” which was a term coined by Gaby several years ago. With poke cakes it’s almost TOO easy to get that wow factor because the cake is soaked in either pudding or sweetened condensed milk, so it’s already better than your expecting it to be. There are hundreds of combinations you could make for a poke cake, I’ve made quite a few myself. These are always my most popular cakes and they are usually the most approachable. Even if there’s a few steps involved, it’s totally doable even for a novice baker. It might seem excessive to buy so many ingredients but when I’m making a cake like this usually get the small sleeves of cookies and the pre-made brownies they sell at the store. You don’t need a ton of either for the topping, but you can also throw some cookies into the cake like I did here. It’s hard to see but there is a layer of Oreos on the bottom of this cake! That’s how I roll. All your favorite things in one cake, this Slutty Brookie Poke Cake is a chocolate cake filled with chocolate pudding, topped with whipped cream and crush Oreos, Brownies and Chocolate Chip Cookies. For the cake: Preheat the oven to 350°F. Spray the bottom of a 9-inch by 13-inch pan with cooking spray. 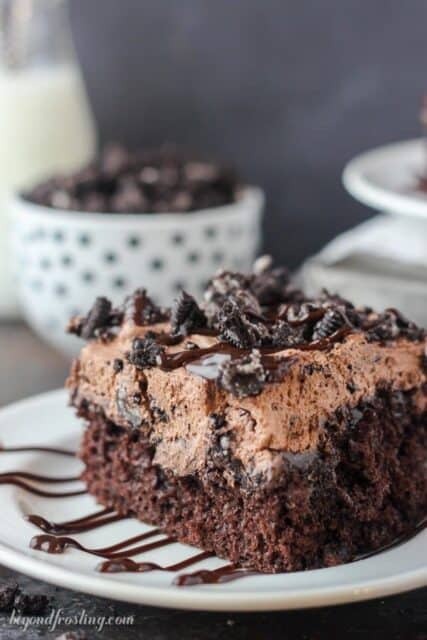 Line the bottom of the pan with Oreo cookies. In a small mixing bowl, combine the instant chocolate pudding with the milk and whisk together until the powdered mix is dissolved. Slowly add the powdered sugar and continue beating on high speed until stiff peaks start to form. Spread the whipped cream over the top of the cake. 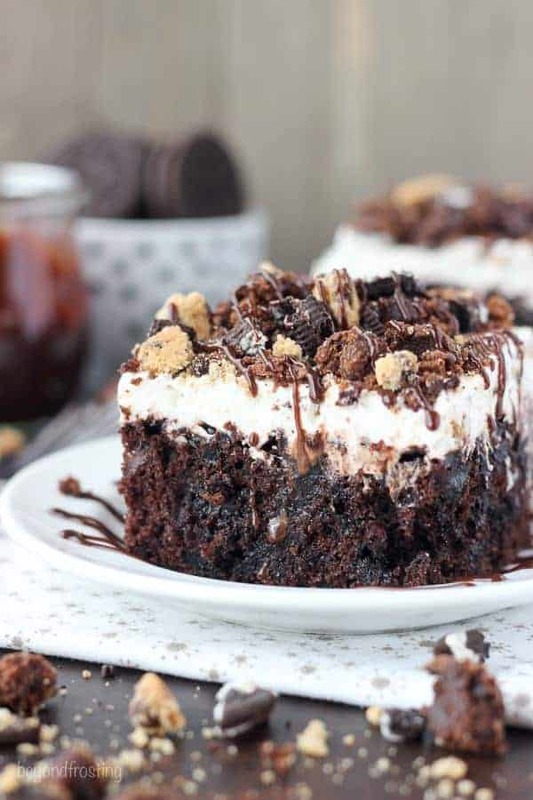 Crush the chocolate chip cookies, Oreos and the brownies and sprinkle over top of the cake. Garnish with hot fudge.